The sea ice cover blanketing the Arctic Ocean and nearby seas thickens and expands during the fall and winter each year. It reaches its maximum yearly extent in February or March. This year (2018), on March 17, the Arctic sea ice cover peaked at only 5.59 million square miles (14,478,033.54 km2), the 2nd lowest max on record. It is only about 23,200 square miles (60,000 square kilometers) larger than the record low maximum reached in last year, on March 7, 2017. This continues a trend of shrinking sea ice, with the four lowest Arctic sea ice maximum extents on record in the last four years. In the video published by the NASA Goddard Channel, Climatologist, and NASA Aqua Project scientist Dr. Claire Parkinson explains how and why NASA studies Arctic sea ice. Dr. Parkinson has been studying sea ice from space for the past four decades. 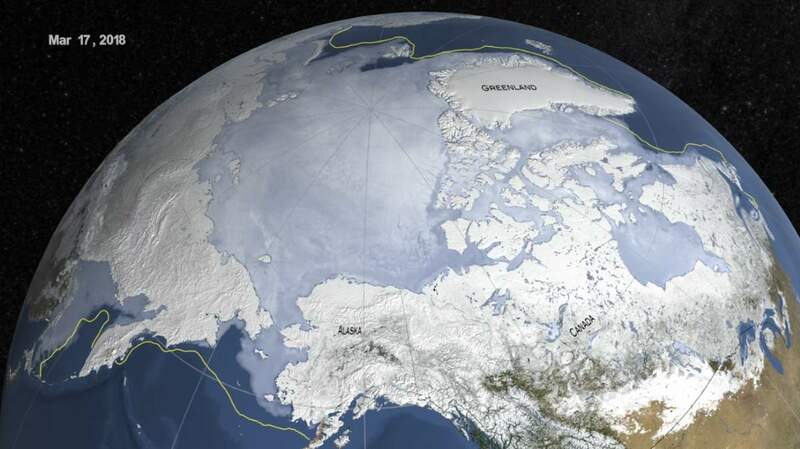 Arctic sea ice reached its annual maximum extent on March 17, according to analysis by NASA and the National Snow and Ice Data Center. The 2018 extent reached 5.59 million square miles, only about 23,000 square miles larger than the lowest maximum on record, in 2017. This continues a trend of shrinking sea ice, with the four lowest Arctic sea ice maximum extents on record in the last four years. Dr. Claire Parkinson explains how and why NASA studies Arctic sea ice. But the sea ice doesn’t just react to warming global temperatures. It can actually accelerate the temperate increases. Sea ice fluctuates with the seasons: it grows during the cold, dark winters until reaching an annual maximum extent in February or March in the Arctic, and then shrinking through the summer until reaching a minimum in September. So, studying sea ice includes how it changes seasonally. Rather than just looking at the annual summer minimum, scientists track how the ice changes throughout the year, to get a fuller picture of change. The Arctic has gone through repeated warm episodes this winter, with temperatures climbing more than 40 °F (22 °C) above average in some regions. The North Pole even experienced temperatures above the freezing point for a few days in February. Arctic Sea Ice Maximum Extent on March 17, 2018. The stunning video below, taken from a bird’s eye view by photographer Peter Cox shows icebergs and ice sheets rapidly melting in the Arctic. United Nations Environment Program said that global warming has been responsible for the melting sea ice around the North Pole. Stunning video taken from a bird’s eye view by photographer Peter Cox shows icebergs and ice sheets rapidly melting in the Arctic. United Nations Environment Program said that global warming has been responsible for the melting ice around the North Pole.